A titanic figure of twentieth century history, among the greatest scientists that the world has ever produced, and a role model to generations of social activists, Linus Carl Pauling is also Oregon State University's most celebrated graduate. Born in 1901 in Portland, Oregon, Pauling and his family split their time between Oregon's largest city and the small farming community of Condon, where Linus' father, Herman, had set up a pharmacy business. Herman died in 1910 at which point Linus, at the age of nine, was forced to work odd jobs to help his mother and two sisters make ends meet. Meanwhile, Pauling had discovered a passion for science that was sparked in part by rudimentary chemical experiments shown to him by a friend in Portland. Determined to pursue further education in the sciences, Pauling enrolled at Oregon Agricultural College - the only school that he could afford - in 1917. He was sixteen years old. Pauling studied at OAC from 1917-1922, taking a year off to work for the Oregon Department of Transportation as a pavement inspector. Majoring in chemical engineering, Pauling also taught a number of classes to his fellow undergraduates; he quickly became known around campus as "The Boy Professor." While in Corvallis, Pauling joined Delta Upsilon fraternity and participated in competitive speaking competitions, ultimately delivering a speech at his graduation in 1922 as the class orator. Following the completion of his studies, Pauling went on to a storied career at the California Institute of Technology, where he completed a Ph.D. in chemistry in 1926 and achieved incredible heights as a faculty member. In 1954, he received the Nobel Chemistry Prize for a series of groundbreaking papers that he had written in the 1930s on the nature of the chemical bond. In 1963, the Nobel Peace Committee honored his many years of vocal activism against atmospheric nuclear testing by presenting him with the Peace Prize. With this, Pauling became the first individual to receive two unshared Nobel Prizes, a unique distinction that he holds to this day. A major contributor to numerous scientific fields, Pauling is remembered by many for his very public fascination with vitamin C. In 1973, he co-founded The Institute of Orthomolecular Medicine in part to pursue his interests in improving human health through vitamin and mineral supplementation. This organization is now known as the Linus Pauling Institute and is a thriving research enterprise located in the Linus Pauling Science Center on the OSU campus. Pauling met his future wife, Ava Helen Miller, in one of the classes that he taught at OAC. Married for nearly sixty years, the Paulings raised four children and traveled the world together. Ava Helen passed away in 1981 at the age of 77. Linus Pauling lived for nearly thirteen more years, ultimately succumbing to prostate and rectal cancer in August 1994. The oral history interview linked to from this page was conducted in the OSU Archives facility in the basement of the Administration Building. 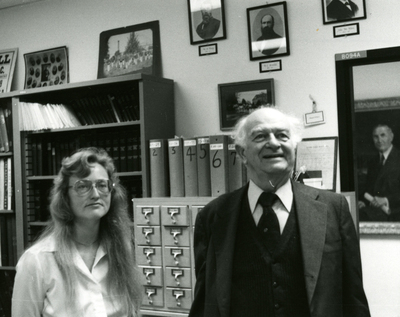 Footage of Linus and Ava Helen Pauling's visit to the Archives, including scenes of Pauling preparing to be interviewed by Ilona Frye, is available here.